Monica Melissa Patterson is surrounded by her legal team during a break in her capital murder trial Friday, October 20, 2017, in the 370th state District Court in Edinburg. EDINBURG — Monica Melissa Patterson abruptly left the courtroom Friday afternoon during a day of testimony that was arguably the most intense of her monthlong capital murder trial. The sound of her heels on the wood floor punctuated an exchange between the judge and attorneys, who were debating whether a long-awaited witness who finally took the stand Friday should testify before the jury about a piece of evidence. It seemed that Celestina Mascorro’s testimony had also come as a shock to Patterson, who according to her defense team, left the room to check her blood pressure. Patterson, 50, is accused of murdering Martin Knell Sr. on Jan. 28, 2015, to access his estate, and Mascorro — who Patterson hired only weeks before to care for the 96-year-old victim — may be the sole witness of what occurred that day. Hidalgo County Assistant District Attorney Cregg Thompson show Celestina Mascorro statements she made to police during the investigation of Martin Knell Sr.'s death while testifying in Monica Melissa Patterson's capital murder trial Friday, October 20, 2017, in the 370th state District Court in Edinburg. Mascorro was living with Knell as a home assistant at the time of his death. 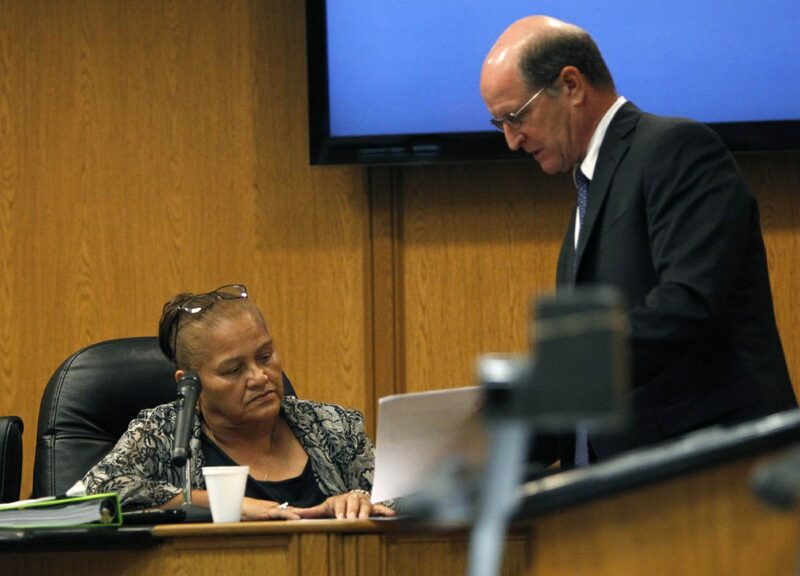 After much speculation by those watching in the courtroom gallery as to whether or not the former caregiver would take the stand, Mascorro, 60, showed little fear when facing the defendant — a woman she testified had a hand in Knell’s death. “This is a crucial part of the trial and I don’t want her not to be present,” state District Judge Noe Gonzalez said before ordering a break so Patterson could collect herself. At question with regard to the aforementioned debate was whether Mascorro could tell jurors what Angel Mario Garza, 39, told her before and after the murder. Garza has also been charged with capital murder, and Mascorro testified that he “smothered” Knell in the kitchen of the victim’s home while she and Patterson were in the garage. Assistant Criminal District Attorneys Joseph Orendain and Cregg Thompson argued that Garza’s statements to Mascorro could not be considered hearsay because he was a co-conspirator in the murder. Gonzalez ruled in the prosecution’s favor. Garza, who remains in the Hidalgo County jail, will be tried at a later date. Mascorro told jurors that Garza called her on Jan. 27, 2015, “when it was barely starting to get dark.” She testified that she was surprised, since she barely knew him and had never given him her cellphone number. She couldn’t tell the jury exactly what Garza said due to hearsay, but Mascorro testified that she “didn’t feel right, I felt nervous” after getting off the phone with him because he wanted to come inside the house. Mascorro said she called Patterson to ask about Garza. The caregiver then called her daughter and an ex-boyfriend upon being unsatisfied with what Mascorro considered to be the defendant’s vague answer. Knell received a call from Patterson the next morning and was left “visibly upset” following an argument, according to Mascorro’s testimony. Half an hour later, Patterson “stormed in” the house, she further testified. “She was real upset,” Mascorro said of Patterson’s behavior, noting her eyes were “humongous” from anger. It was at this point that, according to Mascorro, Patterson allegedly instructed the caregiver to wait in the garage and not come inside until instructed. Mascorro said she was startled when Garza — who she did not realize was also at the residence — rolled down the passenger window of Patterson’s car before exiting the vehicle and entering Knell’s house. Patterson then gestured him into the house, Mascorro further testified, and she noticed he put on a pair of plastic gloves. Until this point in her testimony, Mascorro had maintained her composure, but she began to cry when she told the jury she heard Knell “being smothered” and “struggling” to breathe. The defendant left shortly thereafter, but not before instructing the caregiver to wait “30 to 45 minutes” before calling 9-1-1, according to Mascorro. The witness also testified that Patterson demanded that Mascorro clean the door and door knobs so there wouldn’t be any fingerprints. She was additionally instructed not to tell the dispatcher that Patterson or Garza had been there. Before she said Garza left on foot, he also told her to wait half-an-hour before calling 9-1-1 and warned her that he would be watching her, she testified. “That showed that they had an agreement to commit this offense,” Thompson said of similar statements Patterson and Garza made to Mascorro. 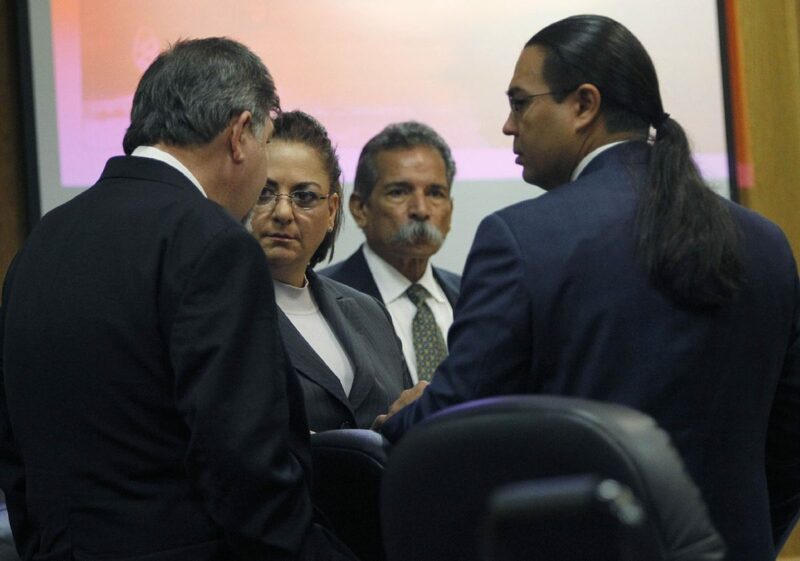 Before Mascorro took the stand Friday, defense attorney O. Rene Flores asked the judge outside the presence of the jury to remind the witness that “the statements she makes in the courtroom can be used against her.” Flores noted that she had, at one point, been considered a “target” of the Texas Rangers’ investigation into Knell’s death. Flores said Mascorro may also face “criminal liability,” alleging that she “owed a legal duty to Mr. Knell and failed that duty.” Citing state law, however, Gonzalez said that any alleged negligence on the caregiver’s part would not rise to the level of a crime, unless other circumstances exist. Mascorro is expected to return to the stand Monday to continue her testimony and face the defense for cross-examination.